As you will see, changes in these factors affect the interaction of price and quantity on every point of our demand curve, resulting in a shift of the entire curve. First, let’s clear up some terminology. In economic terminology, demand is not the same as quantity demanded. When economists talk about demand, they mean the relationship between a range of prices and the quantities demanded at those prices, as illustrated by a demand curve or demand schedule. When economists talk about quantity demanded, they mean only a certain point on the demand curve, or one quantity on the demand schedule. In other words, a change in quantity demanded is very different than a change in demand. A change in demand refers to a shift in the demand curve that affects the whole diagram and the interactions between price and quantity. A change in quantity demanded refers to a movement along the demand curve, exploring different points along the same curve. We examined changes in quantity demanded in Topic 3.2. In this section, we discuss changes in demand. 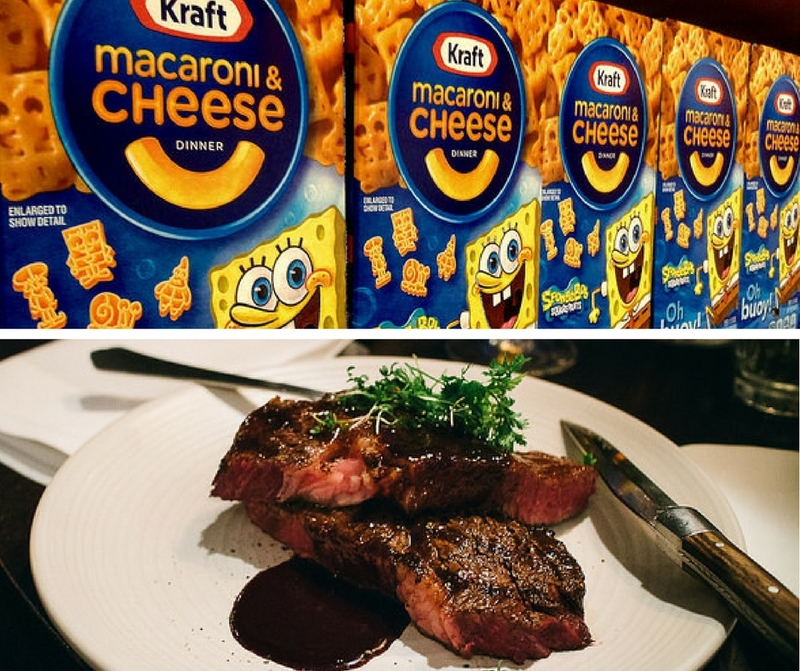 Consider Kraft Dinner and steak. On a student budget, Kraft Dinner or similar low-cost items can be a dietary necessity, but as your income increases, you will likely eat less of these low-quality foods. This makes Kraft Dinner an inferior good. On the other hand, as your income increases, you will likely consume more steak and other fine dining foods, making them normal goods. Note that what we consider to be inferior or normal is relative. A millionaire food connoisseur may regard a food you view as a delicacy as an inferior good that they would only eat if they couldn’t afford such a luxurious lifestyle. Regardless, income is still an important factor in our decision making and it is useful to make generalizations about how the market responds when incomes change. So what effect does income have on the demand curve? Assume we have an increase in income for our consumers of gasoline. With more money you may be less conscious about the amount of gas you use – perhaps you will finally buy an expensive parking pass and drive more. Assuming that gasoline is a normal good, this is going to result in an increase in demand. In Figures 3.3a and 3.3b, we depict two different ways to view this shift. The first way to look at a demand shift is to examine how a consumer’s willingness to pay (WTP) changes. 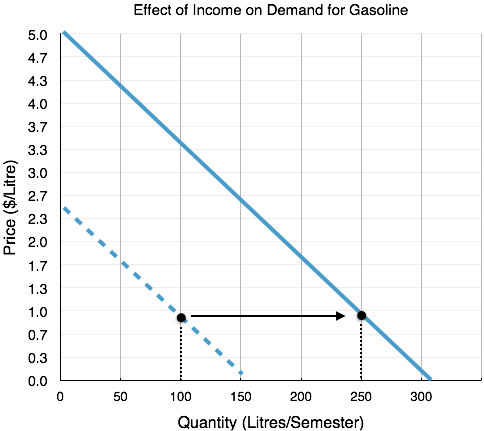 With your original income, you were willing to pay $0.9/L to use 100L of gas per semester (note this is simplified from the example in 3.2 to be linear). When income triples, it is estimated we are willing to pay $3.3/L. Recall that demand is determined by preferences and ability to pay, so for a normal good WTP will increase as income rises. Notice that this increase is uniform at any point along the demand curve. Whereas you were WTP only $1.7/L for 50 units, you are now WTP $4.1/L. All across the demand curve, our willingness to pay has increased by$2.4/L. The second way to view a demand shift is to look at how a consumer’s quantity demanded changes at each point along the curve. At a price of $0.9/L, the student initially has a quantity demanded of 100L. After income increase this has risen to 250L. This way of viewing the demand shift is why we call the change a shift in ‘demand’ instead of quantity demanded as the quantity demanded at every point along the curve has changed. 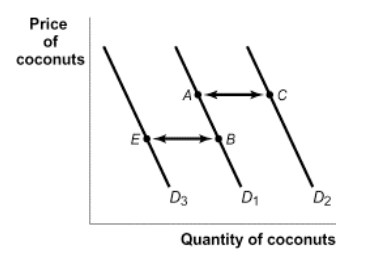 Where the individual actually chooses to consume depends on the supply curve. In 3.2, we examined a demand curve with a constant price. As we will see when we examine the supply curve, shifts often affect both the final price and quantity in the market. The following table summarizes the different effects income changes can have on our demand curve. Note that the best way to learn these concepts is to think of examples and practice shifting the demand curve. You can refer to the table to ensure you are on the right track! Complement goods are goods that a consumer likes to consume with a given good. For example, peanut butter and jelly. 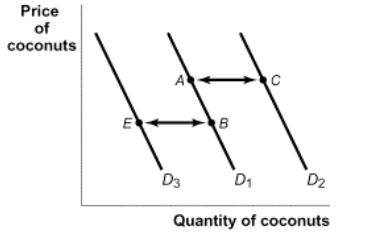 Demand for complements is positively correlated with the other goods price. If jelly increases in price, we will purchase less peanut butter. Substitute goods are goods that a consumer could consume instead of a given good. For example, peanut butter and almond butter. Demand for substitutes is negatively correlated with the other goods price. If almond butter increases in price, we will purchase more peanut butter. Like income, the impact of market price fluctuations on our demand curve depends on whether the two goods are substitutes or complements. The following table summarizes how our demand for a given good can be impacted by price fluctuations of other goods. Businesses are well-versed in the knowledge of complements and substitutes, and often use consumer behavior to their advantage. 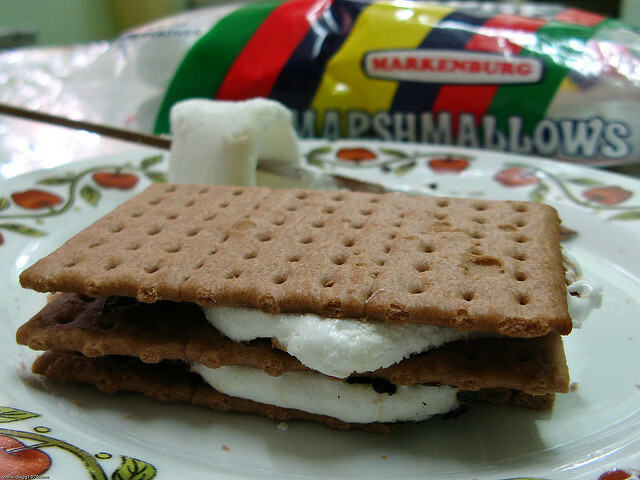 Consider common displays of complementary products, such as a display of marshmallows, chocolate, and graham crackers, each a component of the summer-beloved S’more. A business may put graham crackers are on sale, but not the chocolate. If the graham crackers were displayed alone on sale, the quantity demanded of the good would rise, according to the law of demand. By displaying the goods together, this business is reminding consumers that graham crackers are a complement to chocolate. This will make consumers also more likely to purchase chocolate, even though price has not changed. Our tastes and preferences change over time. In our gasoline example, assume you start dating someone who drives an electric car and constantly reminds you of the impact your gasoline consumption has on the environment. You will likely begin to follow some of their habits and purchase less gasoline. Marketing departments constantly try to influence your preferences, and sometimes even create them. That’s because the more you prefer a product, the more you will demand it! The last determinant of demand we will explore is perhaps the most nuanced. It is that the expectation of the future price of a good can affect how much consumers will demand it today. For example, if you are a frequent shopper at Hudson’s Bay, you will be aware of the company’s regular sales. With sales so frequent, you may be reluctant to purchase any non-discounted item. Since the actual date of the sale is unknown, this is a motivator to wait, decreasing demand today. To really emphasize this point, consider Steam, a digital distribution platform developed by Valve Corporation that sells PC video games online and provides a platform for users to interact. Steam has performed well, with its sales constituting 50%–70% of the US$4 billion market for downloaded PC games. If you are a Steam user, you understand the role of expectations play when purchasing games. Since Steam holds regular holiday-themed sales where they blow out a large portion of their catalog with discounts as high as 80% off there is always the expectation that you can buy the game for a lower price later. This is an even stronger motivator as consumers know exactly when to look for the sales. This will decrease demand for the game when there are no promotions. If you expect the good to become more expensive, your present demand will increase. If you expect the good to become less expensive your present demand will decrease. How soon you expect prices to change will affect the power of expectations. We all know the new iPhone is going to be cheaper six months down the road than when it first comes out, but there are certain benefits to having the product when it first hits the shelves. Firms work hard to create a perceived obsolescence in order to sell goods when they are new. For example, if you fear clothes may go out of style, you are influenced to purchase them immediately rather than wait for sales. So far, while we have hinted at the market as a whole, the majority of our analysis has looked at one consumer and their demand curve. In reality, we know the market is made up of many consumers, each with individual preferences and willingness to pay. 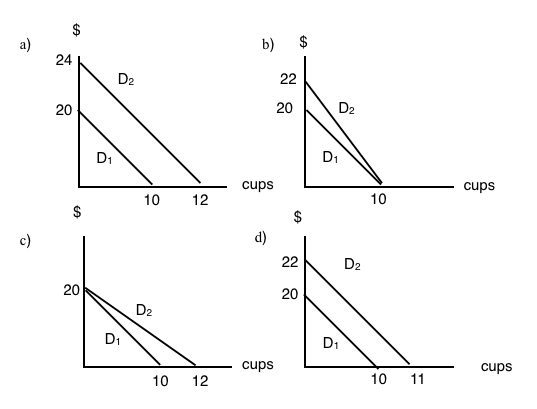 To illustrate market demand (also known as aggregate demand), we can start with two demand curves. 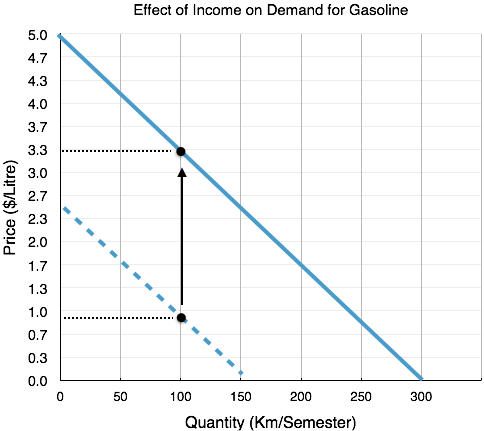 In Figure 3.3e below, two individual demand curves for gasoline are illustrated in green and blue. These demand curves could be different for a number of reasons, consumer B could have higher income, could enjoy driving more, or any other determinant of demand that would make his willingness to pay higher. Notice first that the slopes of the demand curves are the same, and while this need not be the case, it makes analysis simple. 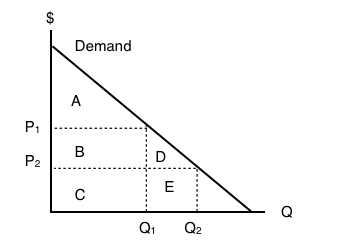 To find the aggregate demand line, you simply pick two prices on the individual demand curves and add up the quantity demanded from each consumer. For example, at the price of $1.3/litre, consumer A has quantity demanded of 100 litres/semester, whereas consumer B has quantity demanded of 200 litres/ semester. 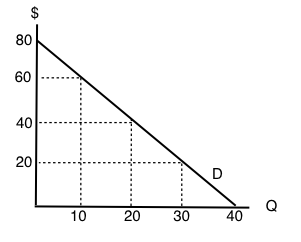 In aggregate consumer A + consumer B have quantity demanded of 300 litres/semester – this gives us point C on the graph of aggregate demand. 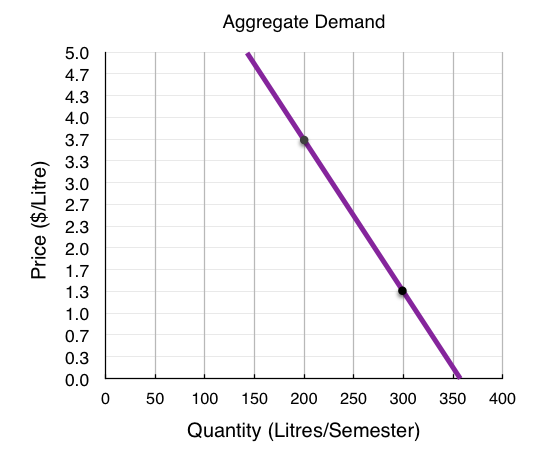 Likewise at the price of $3.7/litre, consumer A has quantity demanded of 50 litres/semester, whereas consumer B has quantity demanded of 150 litres/semester resulting in 200 litres of aggregate demand (50+150). 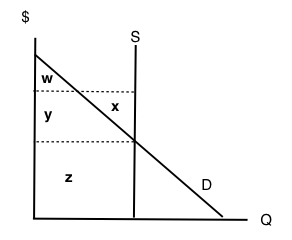 Now you have two points on the market demand curve, with this, you can connect the two points to give the whole curve. Note that market demand behaves in the same way as individual demand: it is shifted by external forces like income, prices of related goods, preferences, and expectations. When examining demand from now on, we will, for the most part, be analyzing market demand to determine equilibrium. We now know that a demand curve is constructed by considering a consumers willingness to pay and different quantities, and the aggregate demand curve is the sum of all consumers demand curves. While price changes influence our quantity demanded, shocks such as changes in income, price changes of related goods, changes in tastes, and expectations can shift our demand, resulting in a different willingness to pay at every level. Now that we understand demand, we can turn to supply and its determinants. The aggregate of the demands of all potential customers (market participants) for a specific product over a specific period in a specific market. 3.3 Other Determinants of Demand by University of Victoria is licensed under a Creative Commons Attribution 4.0 International License, except where otherwise noted.